A forty-year-old skeleton is found encased in a concrete slab at a recently decommissioned nuclear energy site. It becomes a case for the Vermont Bureau of Investigation (VBI) and its leader, Joe Gunther, since they have the resources and the ability to investigate an old, very cold, missing persons case that has now been reclassified as murder. The victim was Hank Mitchell, and Gunther must chase down old rumors and speculations—who benefited from his death and the disappearance of his body? And was his death somehow tied to New York City mafia money being laundered through the construction project? But what seems the coldest of cold cases roars back to life when one of the central figures in this mystery is shot to death, right after speaking with Gunther. And when a young police officer—the son of VBI investigator Lester Spinney—is kidnapped, is that meant to be a warning to the VBI team to drop the case? After all these many years, the truth behind the murder still has to the power to kill, and it’s up to Gunther and his team to capture the living and finally put the dead to rest. 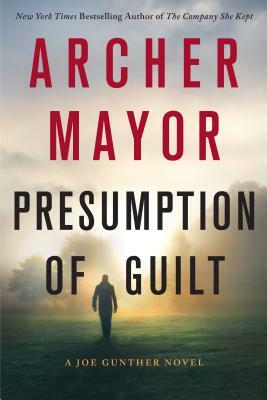 Presumption of Guilt is the twenty-seventh riveting mystery in Archer Mayor's Joe Gunther series.